Open Door Technology has been integrating people, processes, and technology since 1992. Focused on delivering creative solutions built on Microsoft Dynamics NAV (formerly Navision) since 2000, the organization is consistently ranked among the top resellers and development partners in North America. 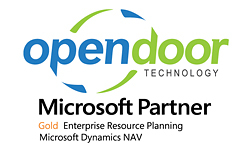 Open Door is a gold certified enterprise resource planning Microsoft partner and a frequent member of the Microsoft Dynamics President’s Club. Open Door specializes in delivering systems built on Microsoft Dynamics® NAV, Microsoft Dynamics® CRM, other Microsoft products and services, and custom solutions. The Open Door Rental Software system by Open Door was built on Dynamics NAV to meet the unique needs of the equipment rental industry. Organizations across Canada and the United States use Open Door Rental Software to gain control of their rental processes in a real-time, fully integrated rental and financial system. Our experienced professionals utilize a scalable methodology and Microsoft technology to implement Dynamics NAV systems configured to match critical business process requirements, which result in competitive advantages and efficiencies for our clients. Our services include business process reviews, project management, implementation assistance, development resources, training, and ongoing support. Our goal is to manage each project to meet three primary goals – on time, on budget, on spec. Articles by Malcolm Roach, Open Door Technology Inc.